Just metres from the river in the centre of Inverness, this 19th-century Victorian town house offers guest accommodation with free Wi-Fi and picturesque castle views. The shops and restaurants of the city centre are just 5 minutes’ walk from Strathness House. St Andrews Cathedral and Eden Court Theatre is next to us. The train and bus stations are an easy 10-minute walk away. Inverness airport is 11km away ( 20 minutes drive ). There is also a very good bus service to and from the airport. Rooms are traditionally furnished, and most have castle and river views. Each also features a flat-screen TV, tea and coffee making facilities, and an en suite bathroom. WiFi is available throughout the house. Breakfast is served in the Riverview dining room. We also have a comfortable and relaxing River view lounge room, where you can relax and watch the river run by. There are no rooms available at Strathness House for these dates. One Double bed. This room has a river view. 2 Single beds. Room with a river view. Parking: On street parking is available and is free of charge. Parking is available nearby at a charge of £5.00 per day. Children: Children aged 5 or over are welcome. Groups: Groups are accepted up to a maximum of 20 people. No stag and hen groups. The River Ness walk is lovely. Walk the River Ness. We did this twice and loved both walks! The RocPool and the Kitchen were both excellent restaurants! Joan and her husband have been gorgeous hosts. It was our anniversary and it has been very special thanks to them. We had room1 with a beautiful castle and river view as we requested. 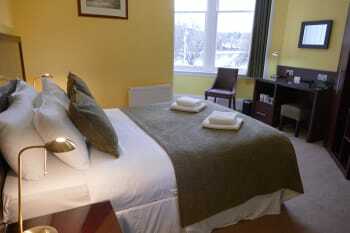 The hotel is only a few minutes walk to the town centre and the train & bus stations. We had an amazing dinner at the River House Redtaurant. Fantastic host and the view and location were amazing! We loved the location, view and room. Bed was comfortable, TV, clean- hot good pressure shower! Staff was friendly and helpful. Comfort Foods was delicious and homestyle! It was recommended by the staff at Strathness and was delicious. We also ate at Georges Thai - food was very good too and the staff was very accommodating. I thoroughly enjoyed my stay and look forward to coming back. The Kitchen Bistro is very good and the staff are very pleasant. Charming hotel with beautiful views of the river and city. Very kind and helpful staff. Had such a lovely stay in Strathness House, extremely friendly and helpful hosts, a beautiful room with a view of the river and all required amenities, my only regret was having to leave so soon. Will certainly recommend this accommodation to any colleagues or friends visiting Inverness. Perfect location close to the city but very quiet, lovely walks to be had by the river in either direction and some nice local bars on the river front which get the evening and afternoon sunshine. The perfect location, close to the centre of Inverness but with wonderful river views. The rooms are well equipped, the food is high quality and the there is always a friendly welcome. Several high quality restaurants are less than a five minute walk from Strathness House. Always book direct, so much better and easier and placed so well in the city centre within walking distance. We tried the bela Italian on bridge street food was excellent. Only stayed one night sadly, will most definitely be back though! Very close to city centre & station but due to picturesque location right on the river you forget you are in the city. Lovely, welcoming owners, room was wonderful, well appointed, spotless & had great river view. Breakfast was a fab start to a long day of train journey to & exploring Kyle of Lochalsh & back again. June was a very hospitable hostess who made sure my every need was seen too. I could not have asked for more! I did the Outlander Experience with Diane and Andy Nicholsin and it was an all day 9 hour adventure. It was magical, moving and knowledgeable and it forever changed my thoughts(in a good way) about Scotland. Chòrd e rium gu mòr a bhith a' faighinn àite-fuirich cho comhfhurtail càirdeil, agus gun teagamh sam bith bha gach cùis mar bu chòir! Nice, period guest house. Very friendly and efficient hosts. Great location. Recommend? Yes! Kind and gracious hosts, walking to theatre & good cafes & shops. Great place to see films, write, read & rest! Very pleasant stay in the centre of Inverness. Room very clean and with nice river view, staff friendly. This was an absolutely lovely experience. The only way it could have been better is if I could have stayed longer. This was our second visit to Strathness House and like the previous visit a year ago, it was excellent. Lovely bedrooms with great views. Very fresh and well appointed. Excellent staff and great breakfast cook! We hope to return next year. Easy to find and close to city centre. Lots of great restaurants within walking distance. My sister and I thoroughly loved our stay in your charming and welcoming home. Our room and bath were clean and pleasant with amenities such as body wash and tea with biscuits! Breakfast was personal and enjoyable as Zaved chatted and served our breakfast requests. Joan was lovely and helped with last minute travel plans. This location was perfect for us as it gave us close access to train and bus and shops and restaurants -all with the stunningly beautiful sight of the River Ness. We dined at the River House and Mustard Seed and several brasseries next door. All of which we would recommend. Take care, we loved you! Very friendly and helpful. Breakfast was good. Excellent room, location and friendliness. Great location, with friendly service. Lovely settting and warm host-wish we could have stayed longer! The room was lovely, the food was delicious and the staff was very friendly! It was a great trip to Inverness. Thank you for a wonderful time! The most wonderful owners and a lovely staff as well. Always helpful with everything, be it booking activities or just recommendations on what to do. In whole just a wonderful experience overall. I recommend eating at Bella Italia, visit the museum, see the look out point at Inverness Castle and take a walk among the Ness Islands! The kind of friendly, helpful folks you want after a long hard day of travel. Excellent location out of traffic and short walk to all city activities. The only thing wrong was the lack of an elevator. The owners couldn't have been nicer or more helpful. Breakfast was delicious. Very professional approach with guests whilst being friendly and most helpful. We would always return to this guest house on future trips to Inverness providing it's run by the same couple. Fig and Thistle and the River House are musts for eating out. Of course the river walk is worth doing for a restful and interesting walk. Excellent stay. Would stay here again. Joan and Javed were warm and welcoming and extremely helpful! Best local restaurants were all fully booked so we recommend making reservations beforehand. Excellent location and facilities and a warm welcome. Plenty of restaurants within a few minutes walk. We had such a wonderful stay at Strathness House, we wished we would have stayed more nights! They graciously accomodated us with a late check in, and the whole experience was lovely. The bed was the most comfortable we had in our two week trek across Ireland and Scotland, and getting breakfast first thing really helped us kick start our day journey into the Highlands. We plan on coming back to Scotland and we have already decided to stay at Strathness again. A very friendly atmosphere and a great breakfast. Beautiful location--you can hear the river gurgling in the evenings. Comfy clean rooms and friendly helpful staff!!! Ask staff for suggestions as to where to go--we got excellent advice on restaurants, day drives, etc. Great location with easy street parking for those with rental cars, but close enough for a pleasant walk to town for dinner and music. Try the Mustard Seed restaurant for dinner followed by live Scottish mustic at the Hootennany. Don't be put off by the name. Quite publike. Beautiful hotel! Convenient, well maintained, quiet, a perfect spot. Bars, Pubs and restaurants less than a block away. Beautiful location on the river across from the Castle. Easy walk to all of Inverness. Very accommodating and pleasant innkeepers. Very good full Scottish breakfast with many choices. Very clean facility throughout. Friendly, helpful. This was our 4th stay there but will not be the last. An excellent place in a great location on the River Ness. Beautiful view on the Ness in middle of centre. Parking near. very friendly people. Lots to see and do right from the front door. Shopping and walking along the River Ness were wonderful. Absolutely wonderful stay, delicious breakfast, quiet area but easy walking to central Inverness. Everyone was super friendly and helped make our time in Inverness fantastic! We did a whiskey tasting at Whiskey Shop that was one of the highlights of our trip. Also enjoyed walking around Ness Island and our Jacobite boat tour of Loch Ness. The hosts were fantastic, allowing us to drop off luggage well in advance of our stay. The room was very comfortable and the breakfast was delicious! The Gellions bar is always a good place for fun. The Kitchen Bistro is very good and not to expensive. Everyone was so friendly. The room was well furnished. We especially appreciated all the USB plug-ins. That made it easy to keep everything charged without having to juggle the one adaptor we had. The breakfast was great. We enjoyed our dinners at Kitchen and the fish and chips hot spot of West End Restaurant and Takeaway (best fish and chips we have had!). Both were very close. We found, even on a busy weekend, that if you go early (before 6) it is easy to get in. We followed the innkeepers advice to take the city bus to Culloden Battlefield, which was very convenient. We then took a scenic 1.5 mile walk through the farm area to Clava Cairns near Culloden. wonderful hospitality and attention to detail! The staff were most professional and courteous in managing a mixup with restrictions on underage guests. We enjoyed our time in Inverness immensely and would not hestitate to recommend the Strathness. Very friendly and lovely hotel. They have a lounge area which is a useful meeting place if your party is across several rooms. Extremely clean and well run and breakfast is great. Would definitely stay here again! Very welcoming and both Joan and Javid offer an individualised service. It feels like home from home at Strathness House where nothing is too much trouble. We really like the Black Isle Bar in town, where they serve many beers from their brewery amongst guest ales. The pizzas are excellent including a vegan option. We also saw dolphins in the Moray Firth so worth seeking them out too. Accomidations were probably the best we had in all of Scotland. Staff was very friendly and professional. The staff was exceptionally warm,friendly, and helpful. Breakfast was very organized, quick and in a lovely breakfast room with a view of the river. I highly recommend the Strathness. An absolute gem. Thank you for your kind hospitality. Very warm welcome and personalised service. Javid went out of his way to offer me choice for breakfast as I’m vegan. The waitress looked after me well too. Over all a first class stay made even better with Lovely people to look after you. I was staying for work purposes but did enjoy an evening stroll along the River Ness and islands. Zizzo’s served me well for dinner. Best stay of our whole trip! The staff went above and beyond to accommodate our group of 9. I will definitely recommend this place to anyone traveling in the area. best location & nice hospitality. I had a great experience at Strathness! Everyone was so friendly and helpful, even offering to provide a packed meal since I had an early morning departure. I would absolutely stay here again if I ever get the opportunity to return. 100% recommend! I adored Inverness. Strathness is located across the street from the River Ness and you can take a nice long walk around it from here. Or you can visit some of the nearby restaurants (I ate at The Mustard Seed which was delicious and close by). You can also cross to the bridge to the main shopping street and visit the castle. When I was there a band of pipers were out practicing which was great! Our accommodations were wonderful. Loved the charm of your facility and thought the location was perfect. I would definitely stay here again and will recommend this place to family and friends. We really enjoyed our stay and wish it could have been longer. Javid gave us excellent advice on where to dine and what to see. Thank you! Awesome location right on the Ness Walk by the river, and across from the Inverness Castle. Very friendly staff & delicious breakfasts. Room was a tad small, but well maintained. Would definitely recommend - thanks to the staff for an excellent stay! Excellent friendly and helpful service. The porridge was much appreciated! Very welcoming and helpful hosts. Good suggestions about restaurants, very helpful advice on driving to the airport. Fantastic Location !! Very,very nice owners. Loved it. Great value and location. The staff were friendly and very helpful. Great value. Excellent location. Breakfast was very good. Staff was friendly and efficient. I would definitely stay at this hotel again. Kool Runnings is a must for dinner and the Castle Tavern for beer. Lovely guest house with beautiful views. My room had everything i needed - including an amazing view over the river. Loads of selection at breakfast apart from black pudding, my fav. Top personal service from check in to departure. Joan and Javed greeted us with warm smiles and welcome hospitality. We loved it here at the Strathness House. A WONDERFUL location, right on the river. Easy to walk to town, along the water, across the various bridges, etc. Close and convenient to everything. Comfortable and tidy rooms, hearty and healthy breakfasts. We enjoyed our time here immensely. Walked to "Ticket to Ride" bike hire and rented bikes for a day to explore the Caledonian Canal bikepaths. Ate at The Kitchen and it's sister restaurant The Mustard Seed. Had a fun time meeting some locals at the Glenalbyn Bar, learning about Snooker and local whisky. Absolutely lovely place to stay. Fantastic location central to everything. Rooms are wonderful and the view is beautiful along the Ness River. The staff are absolutely brilliant! They went above and beyond for me and I’m incredibly grateful. Our stay with you was beyond fabulous. Your hospitality was warm, inviting and the guesthouse was comfortable and especially clean. We couldn’t have asked for better. Thank you. If staying in Inverness, this is the place to stay. Perfect location, perfect guesthouse. The rooms are big, clean, cozy and beds are the most comfortable! Hospitality is beyond what you’d expect! We had the best stay here! The location was perfect and scenic and close to everything. Javid and Joan were welcoming, kind, and helpful when we had an ill member of our group. Thank you for everything. You have a very good guest house. The Kitchen Bistro is a very good place to eat and also do gluten free. Great staff. Very welcoming and friendly. A fine building, well looked after inside and out. Overlooks the river, is close to the city centre, bus and rail stations. It's quiet at night and the modern street lighting allows a good view of the night sky. Comfortable, clean and spacious room. A lovely cooked breakfast. Run by friendly people with excellent local knowledge of things to do eg. museums, historic properties, walks, public transport, where to eat in the evening. Hope to return soon. A short walk from the rail and bus stations through the centre of the city, past many useful shops and places to eat. Do walk along the river bank, upstream to the "islands", good for wildlife. Easy to use, good quality and low cost public transport network. Four rail lines and several good bus routes go out to places of interest. As a regular visitor to Inverness, Strathness is my first choice. Another very enjoyable and friendly stay. Javed and Joan, are excellent hosts who go out of there way to make you welcome and comfortable, its the only hotel, i will stay at in Inverness. This is a great place to stay, warm, clean, friendly and in an ideal situation by the river looking at the castle. Great location, very close to bars, shops, Eden Court. book early for eating out especially at weekends! the Lok ness cruise from nearby lock very relaxing well worth a try. Absolutely spotless. Staff very welcoming. Nice and quiet at night. In a perfect location right beside the river and town centre. Breakfast was fabulous. Would definitely recommend! We really enjoyed our stay here. Everyone was really friendly and had great tips and advice on what to visit during our stay in Inverness. The breakfast was good. We had a room with a gorgeous view of the river and everything was spotlessly clean. I would definitely come here again. The hosts give great advice on what to do and where to eat. You pretty much can't go wrong, there are lots of great restaurants around the hotel! Considered the room to be very comfortable and well equipped for our needs. Will certainly consider staying with you again. Very friendly and accomodation to a high standard. Would definately recommend and hope to stay again in the future. Welcoming, friendly and helpful staff. Very comfortable bed with pillows and mattress of good quality. No traffic noise though in the centre of the town. Good breakfast choice. Would recommend to friends and will certainly return. Ideally located for Inverness nightlife, restaurants, bars, theatre. We really enjoyed our stay at Strathness House and would have no hesitation in booking again. We were greeted with kindness and this continued throughout our stay. Nothing was too much trouble whether asking advice about places to eat out, ordering an egg free breakfast (my husband has severe allergies) or helping us to choose a place to go for a night out. The cleaner even switched her vacuum cleaner off to say hello as we made our way back to our room. Exceptional attention to detail. Many Thanks. If you want to go to the cinema or a theatre production at the Eden Court this is by far the best place to stay its a stones throw away and also very central for most experiences and shopping. Cleanliness and facilities are off the scale(visibly enhanced each year), have already recommended many time to others. Excellent location, attentive hosts and lovely room. Breakfast was fabulous with a variety of choices, would definately stay here again. Guest house was very clean. Bedroom was a good size. Corner view of river. Although it’s af front of the hotel it is a quiet one way street. Ample tea/coffee facilities (with biscuits too!). Bathroom with walk in shower. Flannels provided which is always nice. Small bottles of shampoo & shower gel are also provided. The room was lovely and warm although you could open the windows to get some fresh highland air in. The breakfast was very nice. Choice of cereal, dried/fresh fruit, yoghurt and cooked breakfast. Tea/coffee fruit juices. The breakfast was advertised as a Scottish breakfast although the only Scottish touch was the tattie scone. Haggis or black pudding would have been a nice addition. However I don’t like either so it didn’t make a difference to me either way. We booked very last minute through their own website and the price for the 1 night was very good. Would I stay here again? Yes, its a lovely hotel. Good base in Inverness. We didn’t really go out and about. We did dine in an excellent Italian restaurant on the same street as the the hotel. We like this place a lot! An excellent stay....friendly and welcoming...nothing was too much trouble.Thank you very much. Great location, very clean with a great breakfast. Good value for money. I have stayed here now 4 times and will definitely be back. Close to city centre. Quiet area so not getting disturbed by revellers at night. Excellent couple of days stay. The location was excellent; we had a show at the Eden Court theatre, which is two hundred yards from the hotel. It is a short walk to the centre of Inverness, with lots of pubs, restaurants and shops within a couple of minutes walk. Staff very helpful and friendly. Room was well-appointed with a nice river view. There is no free parking, but we used the nearby long stay car park. A second excellent visit..a comfortable,friendly place to stay, where nothing is too much trouble and one feels really welcome.Many thanks. The house was fantastic and the owners were very friendly. The room and bathroom were great. It was a wonderful stay. Happy Tours did a nice job, and the Italian restaurant down the street from Strathness House was delicious. fantastic stay at Strathness very welcoming athe property was spotless on all areas staff were amazing. Good area for short walk into town. Lovely walks by the river. What we liked you could park your car and leave it as shops, restaurants etc were all within walking distance. Very friendly staff willing to assist with directions and time estimates to attractions. Our stay was great. The staff were extremely friendly and helpful. I would stay here again, and I recommend it to others! We had a wonderful stay at Strathness House. Joan and Javed are so welcoming and treated us like family. The rooms are cozy and comfortable and come with everything you need. The breakfast served in the breakfast room is a lovely start to any day. We so appreciated the personal feel of our stay. Javed greeted us every morning, asked about our plans and made suggestions for things to see, restaurants to try, and offered to make dinner reservations for us. 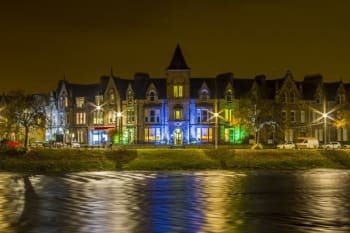 The location of Strathness House is ideally situated on the river and within walking distance of shops, restaurants, pubs, and and of course Inverness Castle. As well, it is an easy drive to Loch Ness, Urquhart Castle, Glenmorangie Distillery and Cullodon Battle Field, to name just a few. Second stay at the hotel ! GREAT !!! Lovely Owners. Good breakfast. Best place to stay in Inverness. The Mustard Seed and Riva were our favorite restaurants. We drove down to Ft Williams to take the Jacobite steam train. Definitely not worth it. Very lovely couple that make us feel at home. Lot of attention to details - explanation, food, clean place, great atmosphere! Well located, excellent room, marcelous view (I got a room with river view). Pity I just dtayed one night. Excellent breakfast! Variety and taste! I would choose to stay at Strathness House on any future visits. The staff are always very pleasant and have a thorough knowledge of the area and can offer advice on places of interest. Interesting museum, good Tourist Information Office, plenty shops, coffee shops and eateries. This is a beautiful guesthouse right across from the river. All areas of Inverness are easily accessible. The proprietor took us to our room upon arrival and showed us everything. At breakfast the next morning, he showed us what was available and said that we could order hot breakfast from the menu. He also gave us suggestions for eating/drinking/sight-seeing. The house itself is beautifully decorated with old paintings and photos of the area, and there is a comfortable lounge. This was a lovely and personable experience. We only wish we could have stayed longer! This is a lovely walking city with lots of restaurants and pubs. It has everything from traditional Scottish food to pizza and Chinese food. We ate at the Castle Tavern. The food was very good, but the tavern ran out of many of its draught beers and menu items by 8 pm. We had steak and ale pie and salmon from what was still available. We also took a local bus to Culloden Battlefield where the Scottish were defeated by the English in the late 1700s. A must for history buffs. Very responsive owners, helpful with travel suggestions. Wonderful breakfast, convenient location for transportation and shopping. Enjoyed the Urquart castle via boat up the river Ness. Also Cawdor Castle, the stones, and Culloden. Got to the latter via bus to airport, then taxi. The food was terrific and the location outstanding. The staff were very helpful in planning our day trips. Great and attentive service, tasty breakfast. Looking forward for the next time! I was very pleased with my stay. The accomodations were great, and the service was excellent. The location was great. It was close to town and had an excellent view to the river. Great location, convenient to everything. We were very satisfied and appreciated the service at the hotel. The location is perfect. A very lovely bed and breakfast! We will stay again when we come back from Texas. Very helpful, very kind. Breakfast was so good- especially the potato scone! I have fairly long hair that doesn't 'air dry' very well so I need a hair dryer. THEY have them. Don't pack one. Also, they have a a laundry service available that is very well priced!! Great place to stay with helpful and friendly owners. Great location on the river and very accessible to walk everywhere in Inverness. A brilliant place to stay, fantastic people!! Highly recommend. Thank you again for accommodating me at your guest house. Food was excellent. My very best, Seumas Coyne. Friendly staff, great morning breakfast. Put on your walking shoes and explore the town. We enjoyed our too short stay at strathness house. It was a wonderful place to use as a base for exploring the nearby area. The innkeepers were charming and very helpful, even making us a takeaway breakfast for a very early morning departure, including accommodating our vegan traveler. We rented a car and traveled to Clava Cairn, Castle Brodie, Culloden Battlefield, and Urquhart Castle. All worthy of a visit. Enjoyed a delicious dinner at the Mustard Seed and a more casual but tasty one at Scotch and Rye. Wished we had planned to stay longer. Easy walk from the railway station. Great location; beautiful accommodation! Friendly and helpful staff. Breakfast was wonderful. This was one of our favorite places on our trip and we actually stayed on two separate occasions. We enjoyed the fresh seafood at the River House restaurant and the pizza at Riva. Great location by the River Ness with views of Inverness Castle. The host was very welcoming, very informative of dining and shopping locations. 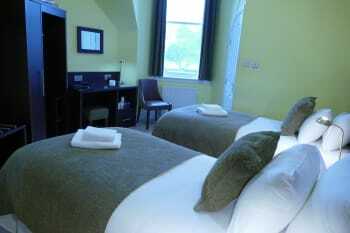 The room was wonderful - large, well laid-out, high ceilings, big window overlooking the cathedral and nice bathroom. Breakfast was excellent, fresh, nice variety, eggs etc. cooked perfectly. Very much one of the best places of the many we stayed at in our trip through Scotland and Ireland. Walk around Inverness - along the river, over the bouncing footbridge, stroll Church St., go into the kilt shops, up to the castle (especially at night). Culloden was amazing - the visitor center was great but especially walking the battlefield. So wonderful! I had to leave on an early train and they made a brown bag breakfast for me to take. It was the best! Great hosts, perfect river view and amazing breakfast! The rooms were clean and had all necessities! A wonderful B&B with great location, right on the dororsteps of the River Ness. Plenty of parking outside. Step out the front door, and you're looking at the River Ness, which offers a great stroll. 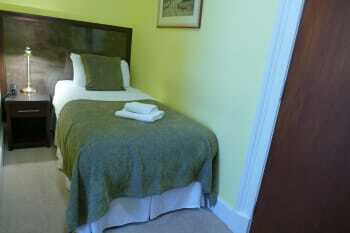 The B&B is clean and has been redecorated to a modern, bright and cheery feel without losing its original character. The hosts are very welcoming and helpful, and offers help and tips with a welcoming dose of humor. Breakfast was great, with a made-to-order hot plate which complements the cold buffet laid out.A great place to stay, and I would definitely stay here if revisiting Inverness. Make a restaurant booking for dinner if you're here during peak season. It's hard to get a table at a good place otherwise. And pay a bit extra for the river view rooms. It's worth it. Wonderful staff. Best view to spend your evening. Very clean faciliteies. Freindly and very knowledgeable staff. All you could expect was provided in the rooms. Close to the river and Castle. I would recommend this guest house to anyone. With luggage, take a taxi from train station to Stratness. Although Google map says a short walk, save yourselves the hassle. Taxi is not expensive like London and taxi Drivers are really friendly with good humour. Great location. Friendly and helpful staff. pleasent greeting on arrival. 1st time I can remember being shown how heating works. Your hotel's cleaness and service are excellent. Thank you very much. Out of the 5 different hotels where we stayed during our visit throughout the UK, Strathness House was our favorite. We loved the lounging room where we could play cards as a family after a day of sight seeing. Beautiful view of river and castle from our room. Great shops and restaurants walking distance from this lovely B&B. Great welcome ,very helpful and friendly. Room and shower room were a great size and both very clean. location couldn't have been better - a two minute walk to city centre. Would stay here again. Got a warm welcome. The owners were very helpful with tips and what to do, and booking tours for you. Beautiful rooms and close by to the city centre. Good breakfast and service. Restaurants to visit: Bella Italia, a small and cozy Italian restaurant with good service. Loqoom, situated by the river. Try their haggis fritters. Do the Island Walk along the river and visit the Ness Island, about an 45 minutes walk from Strathness. Visit the Old High Church, with beautiful view of the river and a spectacular design. I thoroughly enjoyed my stay and look forward to the next time. Try The Kitchen just along the road from the guest house good menu and reasonable prices, also the Rendezvous Café 14a Church Street. Just spent four nights at beautifully located Strathness House. The owners take a personal interest in making your stay as perfect as possible and giving you lots of information on the local area. A warm welcome is guaranteed. Fantastic restaurants locally but it is essential to book on Fridays and weekends. Visit the botanic gardens - a real gem. Plenty of trips on Loch Ness and Loch Ness Exhibition. Trains and buses are excellent for getting around but travel on Sunday is very limited. Lovely place, and even lovelier people! An excellent guest house located right on the river close to all the restaurants. The accommodation is first class and very clean. You will get a warm welcome from owners Joan & Javid. Riva Restaurant which is 150 yards from the guest house offers great quality food & service. We found a warm welcome and a lovely room with a great view and an excellent breakfast. Very nice to stay in Strathness House. Perfect breakfast, very friendly, top lokation. Had a great walk along the Ness to the islands and went to a tipical pub for dinner. We stayed only one night in strathness but we can recommend the Strathness House to each visitor. Joan and Javen are wonderful hosts. I would stay with them again without hesitation. You are walking distance to basically everything in central Inverness, including the train and bus stations. Easy accessible from the main train and bus terminal for our first trip ever to Inverness, it was a short walk with our roller bags. It is on the river ness and we had a wonderful, calm stay, the busier side closer to the bus and train terminals looks quite "animated" shall we say, nice when you are out but we preferred a nice, quiet room. Squeakly clean establishment, attentive but not intrusive hosts, excellent "english, er, SCOTTISH :-)" breakfast. Right on the river near the Cathedral, directly across form the Castle. You need a reservation for eating in the better establishments during the high season, we were lucky, if you prefer to not be lucky, do your research and make a reservation! We were there over Thursday to Saturday evening. Lovely to stroll down to the Ness Islands, don't miss the getting outside the "downtown" to visit the Caledonian Canal and the Merkinke Nature Preserve. This was our second visit and we think it is perfect if we need to stay in Inverness for an overnight . The twin room was spacious, the beds were very comfortable, as were the pillows. The included breakfast was very nice. Good selection and the hot breakfast choices were good. The cook/chef makes the best poached eggs I have ever had! The owners were very helpful in providing local information including places to eat with their personal recommendations. I/we would most definitely stay here again as well as recommend this establishment to anyone that I know travelling to Inverness. 5 stars!!! Lovely view from window. Beds very, very comfortable. Had a great sleep. Lovely staircase and building and plenty of information brochures available. Breakfast was very tasty, fresh and hot. We did find that there were two sockets at the dressing table that the kettle didn't work on, but it worked in the others. That was probably just me not doing it right. We didn't have much time to try local facilities as we attended the Beach Boys concert at The Leisure Centre. We did have a meal at the french named restaurant round the corner, ( sorry, can't remember the name.) meal was really nice and served up piping hot. The staff were very friendly and helpful. There was a great atmosphere. Oh, and there was a pub just along the street from you. (sorry, again I can't remember the name). We Went in after we came back from the concert and they had a dj and were playing Beach Boys and sixties music. It was a nice ending to the evening. Location was superb on the River Ness with many walking routes through city center. La Tortilla is a great Spanish restaurant very close by. Brilliantly helpful owners that will do anything to help make your stay that little bit easier. Mustard seed, la tortilla and the kitchen and my favourite places to eat and black isle bar and hootnanny's for a drink. Enjoyed our stay. The room was very comfortable and the view was lovely. Nice to be along the river walkway. Javid was very helpful. City center, river walks, pubs, restaurants in walking distance. Although calm as located in a sideroad. Friendly service from Joan. A packed-breakfast because i had an early departure was much appreciated. A short walk from the city center on the south side of the bridge. A better choice than chain hotels. Most rooms have river views (mine did). My room (room 1) was vrery compact, which suited me; couples would have to be 'accomodating' to each other. It was up a flight of stairs: carry your bag, so travel light. The Ness Islands and other in-city sights are close, ss is a Tesco supermarket. The river of course is beautiful. Absolutely charming romantic and beautiful setting, our room front river and Castle facing was superb clean as always hosts were as kind as the first time I arrived myself and this time made my girlfriend most welcome too. The breakfast was tasty as is always the case and we had fantastic weekend. My girlfriend got to see the hospitality of not just our lovely hosts but the hospitality that of the beautiful Inverness. First class customer service and a really lovely breakfast! There is a really good italian just along the road! Strathness House is fantastic. The location is great, very good breakfast nod everyone was extremely friendly and helpful. A great accommodation, near everything and quite comfortable. Walk about and discover. Beautiful town. A fantastic place to stay. Excellent hosts who go out of their way to do everything for you. Thoroughly recommend this guest house. Great rooms, fantastic location and view for the city. Quiet and comfortable! 5 star. Perfect. Attention to detail, excellent. No more to be said. Thank you. Walter & Joyce. Amazing restaurant walking distances from the Stathness are the rock pool and the kitchen early meal pre theatre are just simply the best meals am ever had !! Beautiful location. Building was also a stand out for upkeep. Room accommodations large, clean and had amazing view of river. Ten minute walk to train station and five minute walk to downtown. Walk along the river beautiful. Walk to castle fun. Johnny foxes excellent food. It was a wonderful stay: great hosts, great location, and a nice breakfast. Perfect for what we needed. It is such a great location and our view in our rooms was of the River Ness and truly beautiful, especially in a major city. We enjoyed our breakfast and the owners were friendly and courteous to us. The option of multiple rooms closely located was great for our family of five. We were within walking distance to tourist type shops and a good take-out pizza location. Wish we had a little more time in Inverness, it is a truly beautiful city if a little more expensive. The parking can be a little tricky for this area though. I stayed here for 2nights. The owners were very friendly and accommodating. My room was clean warm and spacious with a great view over the river. Bed was really comfy and wifi was good. Good breakfast and excellent service. Very enjoyable stay. A comfortable place to stay, with friendly hosts and an excellent breakfast. Well positioned in a quiet spot but withineasy walking distance of the town. We ate at The Mustard Seed after it was recommended by the B&B owner last time we stayed there. Good food and atmosphere - wise to book a table, especially at weekends. Best place to stay in Inverness. Very friendly and rooms are spotless. Visit The Mustard Seed for dinner. Excellent guest house. Very friendly and helpful. Always a pleasant welcome, we get the room we like, the hotel's never seen a speck of dust, and is perfectly located for our needs. Hotel well placed for access to the Eden Court Theatre, a short walk over the River Ness to the high Street shops, Museum and other delights of Inverness. Very friendly and attentive host.Food excellent,location excellent,comfy beds and walking distance to centre.Thank you we will be back. Had tea in the Kitchen down road walking distance from Strathness House.First class then stopped for nightcap in Palace Hotel 100yds away. Our second visit proved to be as successful as our first. The room we were allocated was spacious, bright with lovely river views. The breakfasts were a real treat and the friendly helpful staff made for a very enjoyable visit. 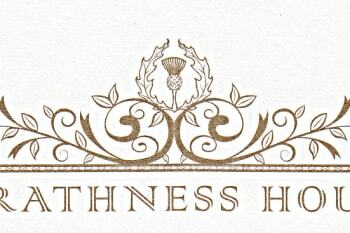 We will definitely make Strathness House our first choice for any future visits to Inverness. Inverness has a very interesting Museum, Botanical Gardens, Eden Court Theatre and Restaurant, great walking and a big choice of eateries. We have stayed several times and always found Joan and Javed to be very welcoming and helpful. This time we needed to leave early in the morning and they arranged a taxi for us and a packed breakfast which was really appreciated. Location is lovely and close to Eden Court and lots of restaurants. It has a really friendly feel and most rooms look out over the river. Great place to stay. Second time we have stayed here and we love it. Owner/ manager is very polite, friendly and very helpful. Extremely good location for cinema, theatre and for city centre. Loads of things to see and do right on the door step. Very well run establishment with attentive staff. Perfect location for Eden Court theatre/cinemas. Spoiled for choice with nearby eating establishments. Eden court / Swimming pool / trampoline centre! Go carting. Most welcoming on arrival and pleasant. Really made to feel at home. Breakfast was first class and dining room spotless. My daughter and I shall certainly stay in this beautiful guest house again. The view was so restful with the river running by. Inverness has many restaurants and lots to do. The Eden Court theatre is close to guest house and town centre a short walk away. All in all a splendid location. Absolutely perfect. One of the best place we have been in Scotland. Very friendly and helpful staff, comfortable rooms with lovely views. 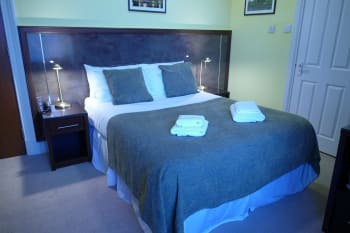 Strathness House operates at very professional level and is ideal for a very comfortable and relaxing break. I was very impressed by the friendliness and genuine interest shown by the owners. Limited car spaces around, may need to park Street away from hotel. I find everything is very well done and everyone is very friendly. Will see you next year. Great location, comfortable rooms, and very pleasant owners. I liked my room on the River Ness. Liked the bright yellow color and Indian-inspired fabrics. Breakfast was good, too. I would have liked to leave my bag and return for check-in. Thank you for taking time to review your stay. Unsure as to whether you did not leave your bag and return for check-in. Most of our other guests do. I do not understand what made you think that this was not possible? This was a clean, well-kept, and efficient residence for my stay during a conference. I would recommend it highly. I can't thank you enough for such a warm welcome to Inverness and such a lovely stay. Thank you both so much. Fantastic location, with beautiful views. We had a lovely stay ,Thankyou ,very clean and good customer service. Book the best restaurants early , as we tried three and they were all fully booked. We were greeted with care and concern upon our arrival. The location was perfect, as was the hospitality. This is a lovely guest house, where you are treated like family. Fantastic stay with warm and welcoming staff. Lovely rooms and delicious breakfast - we had a fab time. 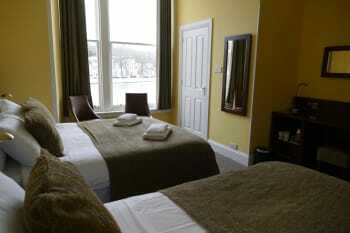 Beautiful bed and breakfast overlooking the River Ness. Great staff and owners go above and beyond and make you feel welcome. Excellent position overlooking River Ness and close to all amenities. Convenient local pay parking and many varied places to eat round about. The rooms are airy with high ceilings and large windows. Hearty breakfasts are served in the ground floor dining room. The Strathness House offers very good value for money and we wouldn't consider anywhere else when in Inverness. Riverside Restaurant lovely. River House Restaurant living on its reputation. Riva Italian restaurant good food can be noisy. Visit Hugh Milers House in Cromarty and lunch at the Sutor Creek Cafe, you may have to book but worth it. Great place and helpful hosts. Excellent breakfast. Bathroom needs towel bars and shelf near sink. Bed very comfortable. Our room was very small so a luggage rack would be helpful. Very welcoming public sitting area. Would return for a larger room. we had a great stay, with lovely hosts and lots of fun in inverness, thank you! Extremely helpful and flexible. Spotless and charming. Great views of River Ness. Close walk to everything. On a lovely walking path on River Ness. Good spot to stay when touring the Highlands! Fantastic location, very friendly welcome and great host. Have stayed in similar priced accommodation in Inverness but this was the best for location and had everything we needed. Room was nice and had a great view of the river. Bathroom was modern and ideal. No bath but we didn't need nor ask specifically for one. Breakfast was great with a large choice to pick from and the waitress was really nice and pleasant. Would definitely recommend! Book early for a meal as Inverness is busy busy during the tourist months. the hosts are very gracious and welcoming. It is unusual to get a tour of the room, including instructions on using the shower, but they do it and do it very well. Ness Walk along the river is very pleasant. Getting to the hotel from the train or bus station is an easy walk, even with roll along luggage. Great stay and helpful host. Many thanks. Great location, great staff and superb breakfast! Best location to explor Inverness, very warm and friendly reception, clean and tidy room, gorgeous & relaxing lounge....Staying at Strathness is believing. The Castle Tavern near Inverness Castle is a pub enabling visitors to feel at home. Enjoy different kinds of local beers with tasty dishes. Immaculate place. Extremely professional and accommodating staff. Book more than one night. The strathness and surrounding area is peaceful and romantic. Perfect location, great hospitality, lovely food and service, incredibly knowledgeable and accessible "host". Thank you for being flexible enough for us staying just one night at your very busy time of year. The hotel staff are very friendly. The manager himself showed us into our room, explained the equipments in detail, and recommended some good restaurants in the neighborhood. The guests are handed the room key, which can be also used to open the entrance door, so we went out and came back freely both in early morning and late at night. This hotel is at the riverside, so I recommend strongly that you choose the rooms with a riverview, but if you cannot book such rooms, you can have breakfast while looking at the beautiful Ness River in the downstairs dining room every morning! GREAT LOCATION, GREAT ROOM WITH A VIEW OF THE RIVER AND GREAT HOSTS! It was simply perfect a big Thank you! The kitchen restaurant! A MUST go! Javed and Joan were very sociable and helpful, showing an excellent standard of care for their customers. The young waitress at breakfast was equally helpful, polite and friendly. The service we received from all the staff here was outstanding! The hotel is ideally placed for the town, very clean and very comfortable. We only stayed for one night but it was an excellent stay! The Cathedral car park, about 200 yards along the road, is probably the best place to park, with fair parking charges. Go along in the evening to put more money in the meter to cover the length of your stay in the morning. When the meter comes on at 8am, the charge starts and gives you enough time for your length of stay, providing you put in the correct amount! We found 'The Auctioneer' restaurant, in Church Street, just a minute over the bridge, to be an excellent place to eat, with a good menu and great service. We really enjoyed our stay. We received a warm and friendly greeting, our room was clean and pleasant with a lovely view over the river. As we had a very early start, too early for breakfast we were made a lovely packed lunch which we enjoyed on the second part of our journey. Thank you so much! We would definitely book to stay at Strathness House again. We only spent one night in Inverness so were not able to use many of the facilities. However I would recommend anyone travelling to the Orkney Islands to book the express bus Inverness to the Orkneys, you will enjoy a lovely view of the countryside via the coastline. Very good value for money! We loved the location. The building was beautiful and it had a lot of history going on with it. The room was wonderful with the rivier view. Easy walking distance to the town center -restaurants and pubs etc. Great staff friendly and helpful. Rooms small but have all the facilities. Only drawback is a lack of lift so if you are on the top floor it is a bit of a struggle to make it upstairs with your luggage. My son and I had a wonderful 4-niht stay at the Strathness House. Located 5 to 7 minutes by foot from the train station and central to all of Inverness. I could hear the river from my room which was very nice while sleeping. My teenage son thought the bed was the most comfortable ever. Owners welcoming and accommodating. Very helpful with things to do. The Mustard Seed is a great restaurant about 10 minutes walk. A hidden gem is the pizza place above the Italian restaurant Riva just down the street. Wonderful stay. The facilities are beautiful. The room is spacious and clean with very comfortable beds. Breakfast was wonderful. Many nearby wonderful restaurants within 1-2 blocks of the B&B. Friendly,helpful staff in this ideally situated b&b. The rooms are spotlessly clean and the breakfasts delicious. Excellent location, delicious breakfast, incredible water pressure in the shower! We had a lovely dinner at Café 1 across the river. This is a great location! Beautiful view of the river. The food is great and the staff very friendly. Also safe and clean. I would stay there again if ever in the area! Just the right location for shops, eden court and pubs and eating out. Another high quality stay. I have been staying here for a number of years now. It never disappoints. Very friendly owners and staff. Very convenient location for a walk along the river. Riva nearby is a good Italian restaurant. The Strathness House more than met our expectations. Would definitely recommend it to others. Had a great meal at Café 1. Great stay at Strathness house! Both Javed and Joan the proprietors made me feel more than welcome. Nice room I slept well in comfy bed . Breakfast was excellent, freshly cooked ,it sets you up nicely for day. Tea and juice on tap , the waitress and Javed serving breakfast very attentive.Great location right in the centre and in lovely location next to river Ness , great for lovely walk after my breakfast ! Definitely 10 out of 10 and would definitely stay there again ! As I said earlier great location so easy access to bars restaurants shops etc or a lovely walk along river ! The owners and staff are second-to-none when it comes to service and hospitality. We lost a bag with the airline and the owners stepped in to help track it down with the airlines, going above and beyond to try and minimize the impact on our trip. Highly recommended! Very friendly. Very clean. Good breakfast. Central location. Very early checkout which is a bit inconvenient especially at weekends 10.30, breakfast finishes at 9.30. Little Italy excellent, also get serenaded by owner very good food and great fun recommend booking. Scotch and Rye cocktail bar very good. Excellent service. Wonderful stay.Very peaceful. Excellent service. Owners and all staff very friendly and helpfull. Fantastic stay very very clean rooms great breakfast. Lovely staff with even lovelier owners. Amazing location with stunning views. Only a stones through from the city center in a nice quiet street. I found my first stay in Strathness to be the most relaxing and enjoyable. Would not hesitate to book again. The location is most central for all activities. Lots of local restaurants, easy walking to town centre and Eden court theatre. Your customer service is amazing!! We loved the inn and Joan was very helpful suggesting things to do, places to go and restaurants to try. Breakfast was very nice. Had a great view toward the river and the room was spacious and clean. Loved The Kitchen and Riva, the Italian restaurant down the street. Also the pub across the river, up the hill (on the corner) You suggested the drive up to Dornoch, Glenmarangerie (sp?) Distillery......loved the trip and scenery. Thank you for a wonderful time in Inverness....it's a good centrally location. A very nice guest house and very friendly and helpful staff. The Kitchen Brasserie is very helpful and does gluten free meals. Strathness House is spotlessly clean and comfortable and the owner is very welcoming and helpful. Breakfast was excellent. There is a very nice lounge. The location is perfect for access on foot to Inverness attractions and shopping but in a quiet location with stunning views over the river. There are some very good nearby restaurants (best to book these for dinner) I only stayed one night on business so did not get a chance to do any sight seeing but had a very pleasant walk along the river. Very helpful for my elderly parents. Excellent Polish waitress. Would be perfect if a bedroom on found floor or a lift. After significant research before booking, we had high expectations for Strathness House. I'm very pleased to say that the wonderful staff and breathtaking accommodations far surpassed our hopes! LOVED IT in every way. Beautiful building, adjacent to River Ness and across the street from a gorgeous cathedral. Nearby is a private, secure car park, which was an unexpected bonus. Many fine restaurants, pubs and shopping are within easy walk. We stayed in 9 different hotels during our 10-day visit, and can easily say that Strathness House was the clear favorite. Lovely clean and friendly place to stay, best breakfast on our tour, shower good but very small and very small towels. Very helpful staff. Very convenient location in Inverness. It is in walking distance to the train station, most activities in the town and right next to the River Ness. The owners were most helpful in securing taxis and restaurant recommendations. The rooms were nicely appointed and the beds were comfortable. Breakfast was delicious with many options. If you are taking the bus to Culloden Battlefield, make sure it is running. We had to take a taxi to the sight because it was a Sunday. An excellent guest house which is very clean were you will always receive a warm welcome. Great town location with fantastic views over the river. Riva & Rocpool restaurant's are very good value with the pre theatre menus. Have visited you before and will again. I marked 4 for facilities only because a bath would have been good. However you can't have everything in life! Just stay here and the staff will give you all the information you need on the whole area. Such a great place to stay. Staff are excellent. The young lady who looked after us at breakfast can not be praised enough, lovely smile and manners and very attentive. "The Kitchen" and "The Mustard Seed" restaurants nearby were both excellent, with good locally sourced menus. Made most welcome. Will definitely use you again. Great room and terrific breakfast. Thank you very much. Lovely surroundings, and very friendly staff. Very comfortable rooms and excellent breakfast at very reasonable rates. Fist class hospitality in this beautiful, well appointed family run hotel. This was my third stay and I,will certainly be back! Spoiled for choice with fabulous restaurants on the doorstep including Rocpool, the Kitchen and the Mustard Seed. I had a very good stay and actually could not find any fault with your guest house. The Kitchen Bistro was a very good meal. For other Gluten free guests the Rendevous Café in Church Street. Beautiful views over the river; convenient location; very comfortable, clean and well-appointed room; staff couldn't have been more helpful. I have stayed in many Inverness hotels and guest houses but this would be my first choice. We loved our stay at Strathness House! The room was very lovely and the location can't be beat. The owners were very welcoming and accommodating and gave us loads of information. We're glad we're coming back next week! Ask the owners for restaurant tips - we had a wonderful dinner at The kitchen. They also gave us a tip for a lovely walk o n the Ness Islands - highly recommended! A great find and a Guest House I will definitely be using again when I visit Inverness. The rooms were larger than average and very clean with an iron, kettle and ample coffee/tea making products available. The breakfast was great and freshly cooked which I find much better than the stuff you get under hotplates in the larger less personal hotels. The proprietors were very friendly and helpful. Full of useful suggestions for bars, restaurants, places to visit and local walks etc. We went for a drive around the Black Island and did a few local walks. The proprietors can help with directions. We had a few pints and a nice bar meal in the Exchange which is next to the Train Station. We also had a beautiful Italian meal at Riva which is just a short walk from the guest house en-route to the city centre. Great place to stay. Will definitely return. For a lovely meal head to little Italy - great food, great atmosphere and great staff. Already recommended you to other travellers, and think you're just grand! I have stayed here from time to time over the past 10 or more years for work purposes and the accommodation and service has always been excellent, and is being continually improved. Only a five minute walk from the station and town centre and a good Italian restaurant (Riva) is just up the road. Very hospitable as always and a relaxing stay. The eggs at breakfast were fantastic! Extremely welcoming owners, spotlessly clean and comfortable room . Shower room immaculate , and fresh clean towels and bedding. Breakfast was excellent, freshly prepared and all dietary requirements catered for. Thank you for all of your attention to detail, we had a very enjoyable stay. Centrally located, near many restaurants, Eden Court theatre and city centre amenities. Beautiful house overlooking the river, very quiet despite being in the city centre Highly recommend! Excellent breakfast with friendly staff and hosts. Central location with a number of good restaurants nearby. Well situated for touring in the highlands. The best place I've found to stay in Inverness, clean, very friendly and an excellent breakfast. Enjoyed a most wonderful stay at Strathness House- terrific setting and outlook. Personal and helpful service and where I choose to stay whenever in Inverness on business or for leisure. Great location, great guest house, great hosts. Visit the Inverness Museum (behind the tourist info office). I have stayed repeatedly and received consistently good service everytime, with the extra touch of personal likes/don't likes attended to with generous spirit on the part of Joan and Jared. This place really does feel like coming home when I get there. Location is infinitely useful for city centre access and good walks down the river. Sams curry house is a good one, tried and tested - and the Steak House if you like a juicy T-bone steak and the Turkish place is supposed to be very good food but I will try this during repeat visits in the future. If you are there during fishing season (Summer to mid September), you can take a lovely walk down the river, past the cathedral and over the walking bridge, with charismatic views of fishermen in their waders up to their waists in the water, flyfishing, which makes for good photos. Wonderful stay! The staff were so helpful and pleasant! Thanks so much to Joan and Jared for making our short visit such a pleasure. We especially appreciated your help and advice when we had car trouble. The Strathnness is beautiful and wonderfully situated for a visit to Inverness. Hospitality and service were exceptional. A very enjoyable experience oveall. Didn't like the hairdryer in the drawer though. Highly recommend Fig & Thistle and Rocpool restaurants. The house is nicely decorated. The rooms are very comfortable and full of attentions such as the ironing set, bathrooms amenities, city guides. We were nicely welcomed by the owners. We loved our stay at Strathness House. Lovely stay as always - looking forward to my next visit! The Mustard Seed and Waterside Inn restaurants are very nice but it is advised to book. The Castle Tavern is also recommended. I had a wonderful stay. The view of my room was fantastic and the location couldn't have been better. The place was so quiet, that I had a rewarding rest every minute I spent there. Great shower and bed too, perfect after spending a long day touring around. The hosts' attention was great, taking care of every detail. The breakfast was really good! As I said, I had a wonderful stay. Inverness is a beautiful city to stay. It's also a perfect location from where you can tour the Highlands. The day group tour to Isle of Skye with WOW Scotland was great. The adventure of going to the Highland Folk Museum in Newtonmore was fantastic. And I also strongly recommend the private tours with Gordon, from Highland Tours Inverness. I took the historical tour and it was simply fabulous! If we could give Strathness House a 10 we would. the second we arrived, the host was helping us solve a situation. Our stay at the Strathness House was the best in our 14 day Scotland trip. Beds really comfortable and rooms well equipped. Staffextremely helpful and freshly cooked breakfast delicious! Fantastic location beside the river. Friendliest and most helpful staff! Couldn't have been made to feel more welcome and at ease/ at home. The ratings we have given say it all. Couldn't fault Strathness House. The Riverside Restaurant in Bank Street and the Fig and Thistle Bistro in Stephens Brae are our recommendation. From the moment we stepped in the door we were made to feel welcome,we were given comprehensive advice as to the best places to eat and how to best get around Inverness. The room itself was lovely, it had character and was very spacious. The breakfast was plentiful and very tasty. There are numerous bars and restaurants within walking distance, we found the ones on the banks of the river ness to be better for us as the ones in the centre were filled wilth a younger more boisterous clientele. The walk around River Ness islands takes around 45 minutes and the setting is beautiful. There are many places to visit with Inverness as your base and the local bus service can take you to Loch Ness for a boat trip within 20 minutes for £4.00 return. Very nice bed. Godd service at the desk and very good recommendations for sightseeing. We have stayed a number of times at Strathness House and have always been more than satisfied. The standards of all the above are very high. It is particularly pleasant to be remembered and welcomed by Joan and Javed, even when there has been quite a long gap between visits! We have eaten at several restaurants including the Mustard Seed and most recently The Kitchen Brasserie, where we enjoyed a delicious early evening meal served by friendly staff within easy walking distance of Strathness House and Eden Court. Eden Court has great shows and films. Only stayed one night but it was obvious that Javed & Joan take great pride in their business. The room was lovely, spotlessly clean and very comfortable. We really enjoyed the freshly cooked breakfast and there was plenty of choices for all tastes. Everyone was very friendly and helpful and we look forward to staying at Strathness again. Had our evening meal at Cafe 1 on Castle street which was excellent, first class food and drink with very attentive and friendly staff. Book early for a table though. Real Ale fans should visit the Castle Tavern (handy for Cafe 1), Blackfriars and The Phoenix Ale House. Very friendly staff and very helpful. This was the only place during my trip where my request for soya milk in my room was met. Also, because I had to leave early to catch a train they very kindly provided me with some food to takeaway. The location is superb and, all in all, I had an excellent stay here. If you're vegan and looking to stock up on goodies for a journey I found an excellent shop tucked away in a side street in the city centre: The Health Shop on Baron Taylor's Street. Ignore the slightly depressing surroundings of this backstreet, as the shop is well worth a visit. The staff are friendly and it has a fantastic range of foodstuffs and toiletries. It was so lovely visiting with the staff. They were so welcoming, friendly, and just the perfect front to this awesome location. I am so thankful that I asked for recommendations and got this one. It was totally worth it!! It is so centrally located that it is an easy wander across the bridge to the Inverness Castle, which had the most spectacular view of the city. Inverness was lovely! I can't wait to go back. Everething was perfect,and mayby till next year.Gr.Rinus. Lovely place and a lot seeing and to do. Castle and the old Town. Great place to stay in Inverness right on the riverbank and close to all amenities. You will always get a warm welcome from owners and staff. Highly Recommended. Very good restaurant's close by are Riva, Rocpool and the Riverhouse. Always a pleasure to stay here - and hospitality of hosts was top notch! Will be back again! This is a lovely small hotel in a great location next to the river. It is within a short walk of the town center and has some good restaurants close by. The staff are friendly and have good knowledge of the local area. Our stay at Strathness House was perfect. The location allowed us to explore Inverness within easy walking distance to town. We loved its location along the water with wonderful views across to the city. Joan and Javid were extremely helpful with all things and it is apparent they love their business and the people they meet. Many places are a short walk away. We had our young adult niece with us and enjoyed the youthful fun at Johnny Foxes and Hootenanny. A warm welcome. Excellent breakfast. Staff very helpful. A small steak house between Highland House of Fraser and James Pringles Weavers. Had my first venison. Superb! A warm, friendly atmosphere and not to expensive. Very pleasant welcome, lovely room with everything you require. The view was amazing, we looked directly out onto the River Ness and I must of taken 20 photos from my room window. It was beautiful. Breakfast was good, again what you would expect from a good hotel. Ideally sited for Iverness centre. Pubs, restuarants, shops and the rail/bus stations all within 10 mins walk. Actually the pub was 2 mins! Would definitely recommend and stay here again. Wonderful location in a beautiful area. Staff is friendly, helpful, and aim to please on every level. Good central location, fantastic view from the riverside rooms, excellent breakfast and attention to customer service by the proprietor. Great stay, lovely place very freindly staff. will be back. A great place to stay...and pristine and roomy. Lots of VERY nearby places to eat. Very friendly staff. Great breakfast options. We had a wonderful stay at Strathness House. It was perfectly located in the City, had wonderful amenities, and the staff were exceptionally courteous and helpful. It was a perfect highlands stay. Have been coming here since 2010 and everytime I come I'm always made most welcome. As to all earlier reviews I can say not one thing has changed except they now have a well deserved 4 star rating which is of no surprise. This little guest house checks all boxes, immaculate inside and out, tastefully decorated, friendly staff and management, tasty cooked breakfast, the owners knowledgeable about the area and local interest. For a 5 star experience I recommend Strathness Guest House. I look forward to my next visit and to seeing my friends Joan and Javed again. Nice place with a great location, very friendly staff! Staff were very helpful, kind and welcoming. They also seemed to enjoy working there and had a nice rapport with other guests - nice folk all-round. Excellent accommodation, convenient and comfortable. Very nice welcome and taken to room with everything explained. Stayed three nights and being a solo traveller felt very comfortable and safe. Situation of Strathness House is beautiful and very convenient. Purpose of my visit was to take the scenic train journey to Kyle of Lochalsh - a good way of seeing spectacular scenery. Straight out of the front door of Strathness House onto the riverside walk to the botanic gardens and then crossing the river via the islands is worth doing. We like "The Kitchen" but there are more good restaurants. A great place to stay. Really comfortable room and an excellent breakfast. Room had beautiful view of river. Joan, Javad and staff were really kind and helpful. Nothing negative to say, a fantastic place. I had a very enjoyable stay. Owners and staff were very welcoming and helpful. Breakfast first class. Hotel location could hardly be better. I am sure there is always room for improvement but I can't think what it could be. Keep up high standards. Extremely helpful and lovely people. Very very clean and most of all it was a warm and cosy place to stay. My wife and I often visit Inverness as our son and family live there. This is the first time we have stayed in Strathness House. What a lovely place. A lovely room, great view. The breakfasts were excellent. We will definitely stay there again. You are made to feel very welcome right from the begining and the owner was there in the morning to welcome you to breakfast, one of the most friendy places i have stopped thankyou. Restaurants are very busy so book ahead if possible and there is entertainment in many public houses. Staff are very nice. Excellent view to River Ness. Also good breakfast. We only stopped for the one night but really enjoyed the stay and would strongly recommend it to anyone. Up to usual high standards. Nice hosts,make you feel welcome not like some of the other places we have stayed,and will help make the most of your stay.Highly recomend.